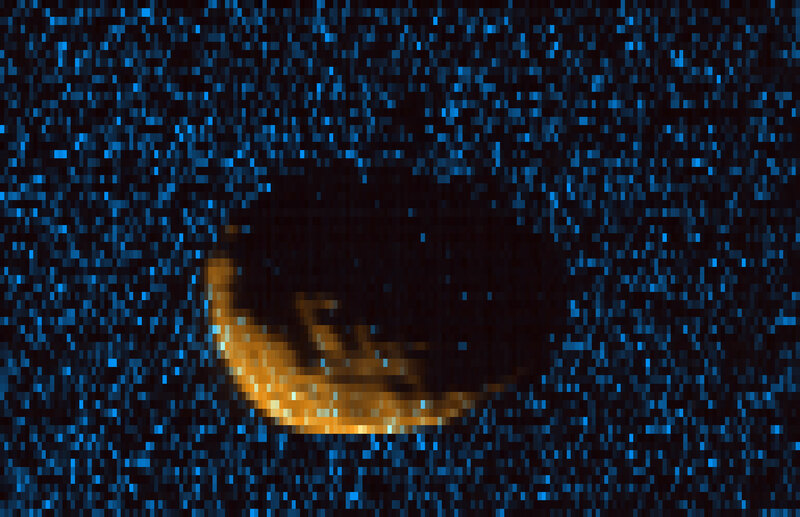 Phobos as observed by MAVEN’s Imaging Ultraviolet Spectrograph. Orange shows mid-ultraviolet (MUV) sunlight reflected from the surface of Phobos, exposing the moon’s irregular shape and many craters. Blue shows far ultraviolet light detected at 121.6 nm, which is scattered off of hydrogen gas in the extended upper atmosphere of Mars. Phobos, observed here at a range of 300km, blocks this light, eclipsing the ultraviolet sky. New observations from NASA’s MAVEN Mission has scientists closer to solving the mystery of how Mars’ moon Phobos formed. In late November and early December 2015, NASA’s Mars Atmosphere and Volatile Evolution (MAVEN) mission made a series of close approaches to the Martian moon Phobos, collecting data from within 300 miles (500 kilometers) of the moon. Comparing MAVEN’s images and spectra of the surface of Phobos to similar data from asteroids and meteorites will help planetary scientists understand the moon’s origin – whether it is a captured asteroid or was formed in orbit around Mars. The MAVEN data, when fully analyzed, will also help scientists look for organic molecules on the surface. Evidence for such molecules has been reported by previous measurements from the ultraviolet spectrograph on the Mars Express spacecraft. 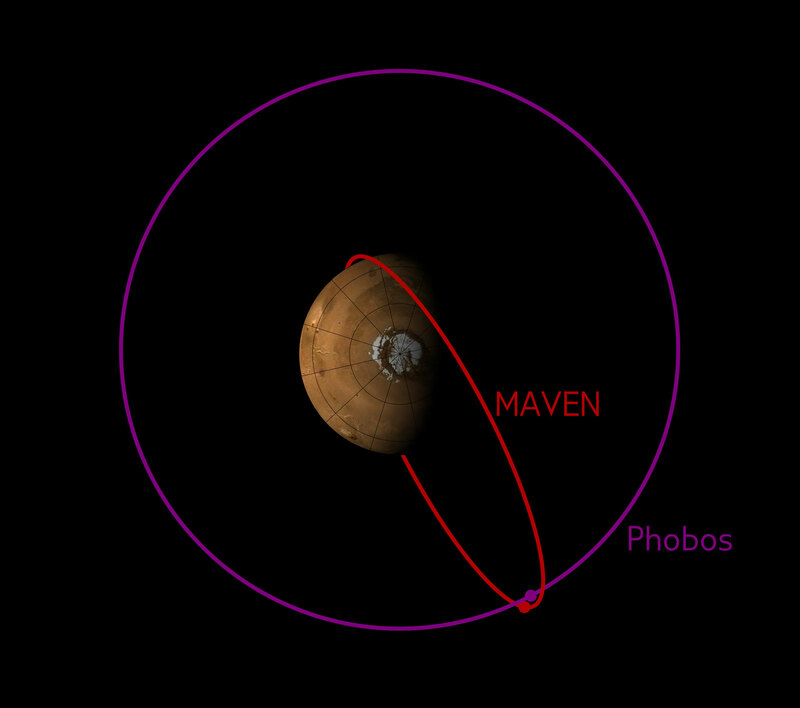 The orbit of MAVEN sometimes crosses the orbit of Phobos. This image shows the configuration of the two orbits in early December 2015, when MAVEN’s Phobos observations were made. MAVEN’s principal investigator is based at the University of Colorado’s Laboratory for Atmospheric and Space Physics, and NASA’s Goddard Space Flight Center in Greenbelt, Maryland, manages the MAVEN project. Partner institutions include Lockheed Martin, the University of California at Berkeley, and NASA’s Jet Propulsion Laboratory. 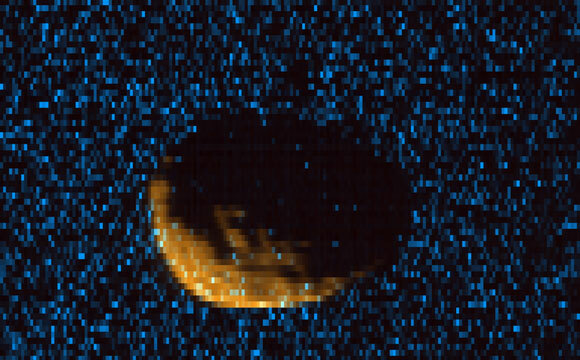 Be the first to comment on "NASA’s MAVEN Spacecraft Observes Mars Moon Phobos"